Well well well, look what we have here: another Batman villain who's nothing but a large ham. Lazlo Valentin was a gifted scientist who suffered a schizophrenic break causing him to develop a deranged new persona named Professor Pyg. Pyg formed the Circus of Strange and began touring the country, leaving a string of mysterious missing persons cases in his wake. An obsessive perfectionist, Pyg uses identity-destroying drugs and invasive surgery on his victims to create genderless lobotomized humans known as Dollotrons. 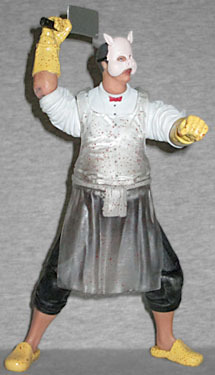 Professor Pyg was created by Grant Morrison, based on the Kahimi Karie song "Pygmalism," which views the relationship between Henry Higgins and Eliza Doolittle (of My Fair Lady fame) from the perspective of the woman being changed, making it less about someone being cultured and more about mind control. It's exactly the kind of terrible music you'd imagine Grant Morrison listening to, but it provides an interesting new slant on a familiar story, and makes Herr Professor Pyg's goals and motivation clearer: he wants to turn people into his weird idea of "perfect." Despite being a relatively new creation, Arkham Knight is actually Professor Pyg's second adaptation in alternate media - he first appeared in Beware the Batman, presumably because they wanted to set expectations very, very low right from the outset. The cartoon made him an eco-terrorist, but the game keeps him what he is - a psychotic surgeon in a silly porcine mask. Actually, that mask is removable! As far as we can tell, Professor Pyg has never been shown unmasked in the comics, so this is a first. In keeping with his perfection obsession, he's got the plasticky, tightly drawn look of someone who's undergone far too many facelifts. It's not as pronounced on the toy as it was in the game, but it's still unsettling: big kissy lips, pronounced rounded cheekbones, and eyebrows that are doing their best to arch their way up off his face. He actually looks less disturbing with his pig mask on! Pyg is wearing a white dress shirt with a small red bowtie, and dark pants. That sounds like a pretty boring outfit, except he's got his sleeves and pantlegs rolled up, is wearing bright yellow rubber gloves, and what appear to be yellow Crocs - he's like an evil Mario Batali! 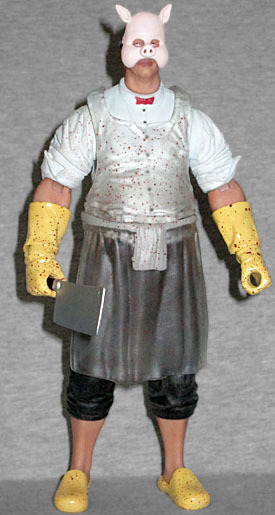 To protect his fine clothes from blood splatter, he's wearing a clear plastic butcher's apron - clear plastic in the world of the game, and clear plastic here on the toy, too. It's partially doing its job, because while there's blood all over his gloves and shoes, it's mostly avoided his shirt (just some on the right sleeve). The piece is made from soft PVC, and since it's clear, you can easily see the two notches in the toy's shoulders where it's glued in place. Was that really necessary? Would it not have stayed on by itself? You don't really "fight" Pyg in the game - you confront him, and you get ambushed by a bunch of his Dollotrons, but as for the man himself, he just stands back and throws cleavers at you, then you hit him once and it's over. Despite that, this figure doesn't skimp on the articulation: he has a balljointed neck, swivel/hinge shoulders, elbows and wrists, a swivel waist, swivel/hinge hips and knees, swivel shins, and even rocker ankles. The figure stands nearly 6⅞ tall, but for some reason his head is super tiny. It almost seems to be scaled for a 6" figure - maybe they reduced it so his pig mask wouldn't need to be oversized? If so, that was a poor choice. This is a Gentle Giant sculpt, so scaling one section of the digital file would theoretically have been easy. 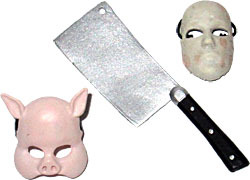 Beyond the mask, Professor Pyg still has two accessories: a meat cleaver, and a plain white mask. No, they're not linking him with Anarky, that's what the game's Dollotrons look like. The Dollotron mask is also closer to a 6" scale than 7", and there's a thin elastic strand that will allow you to slip it over another toy's face. Or Lazlo's, I guess, though he doesn't really wear them himself. Professor Pyg and his Dollotrons played to Frank Quitely's strengths as an artist: he draws very nice animals, and human faces rendered so badly that no one would ever want to look at them. So a guy in a pig mask leading an army of identically mutilated soldiers? Frank's your guy! The character integrates with the Arkham world seamlessly, and his apperance there helps solidify him as a "real" Batman villain, not just one creator's pet project. 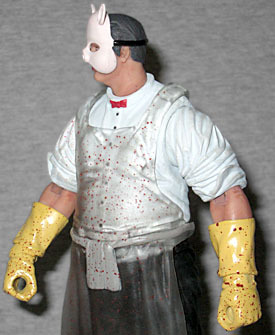 For our first-ever figure of Professor Pyg, this is mostly well done - and when are we likely to ever get another?